Tesla‘s stock was up 2.5% ahead of a shareholder vote on Elon Musk’s compensation package. Tesla’s board filed a proxy statement outlining a “compensation performance award” that would grant Musk $US2.6 billion in stock options if the company hits key milestones in 10 years. Watch Tesla’s stock price move in real time. 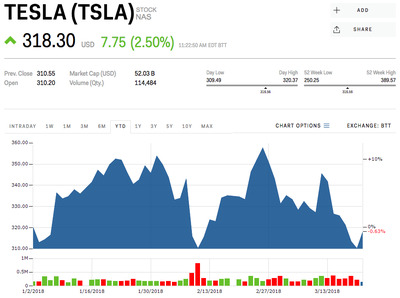 Shares of Tesla were rallying, up 2.5%, ahead of a shareholder vote on chairman and CEO Elon Musk’s compensation package. The pay package would better align Musk’s interests with the company as it would grant him $US2.6 billion in stock options based on performance targets. The “compensation performance award” would give Musk options with 12 potential vesting tranches if the company hits performance targets on both a top- and bottom-line basis over 10 years, according to the SEC proxy filing. Musk will not receive any salary, cash bonuses, or equity that vests “simply by the passage of time,” Tesla’s board said in the filing. “If all of these milestones were to be achieved, Tesla will have meaningfully achieved its mission of transitioning the world to sustainable energy and will have become one of the most valuable and successful companies in the world,” the board stated in the filing. The vote comes amid a slump in Tesla’s stock performance. Its shares have fallen 18.5% since hitting an all-time high in September. Many industry watchers have cast doubts on the company’s ability to move past its production bottlenecks, largely precipitated by lag times in producing battery modules for its electrical vehicles. Tesla’s stock was down 0.63% this year.